Being 50% lower in fat than beef and 40% lower in saturated fat than chicken, our Goat Formula is the healthiest pet food you can feed your pup. If you dog has any pet food allergy, Goat is a great start to elimination diets, being a great alternative to beef or chicken. Combined with our Goat Formula being grain free, this healthy dog food is a great hypoallergenic dog food. Pups love the great taste of our Goat Formula dog food. 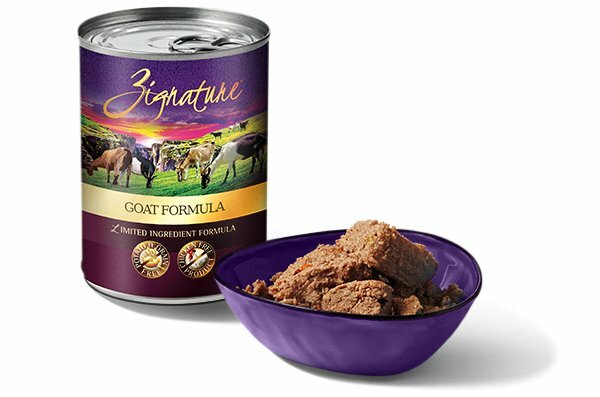 Rich in iron, high in unsaturated fats, Goat Formula is a great alternative to even the best dog food. Goat, Water, Goat Lungs, Goat Liver, Peas, Chickpeas, Agar-Agar, Tricalcium Phosphate, Calcium Carbonate, Potassium Chloride, Salt, Sunflower Oil, Choline Chloride, Minerals (Zinc Proteinate, Iron Proteinate, Copper Proteinate, Manganese Proteinate, Sodium Selenite, Calcium Iodate), Vitamins (Vitamin E Supplement, Thiamine Mononitrate, Niacin Supplement, Calcium Pantothenate, Biotin, Vitamin A Supplement, Riboflavin Supplement, Vitamin B12 Supplement, Pyridoxine Hydrochloride, Vitamin D3 Supplement, Folic Acid).